Mardi Gras is just around the corner, I thought it would be fun to share a few recipes and a couple personal pictures from my trip to NOLA (New Orleans Louisiana). The first time I read or heard the word Gumbo I turned my nose up immediately, the picky Melanie came out (boy, she’s boring). But when in Rome as they say – so with a “mostly” open mind I went on a trip to New Orleans with my friends Kay and Kim, then discovered a whole new way to eat. I tried something new with each meal and fell in love with the cuisine. Here are couple recipes easily put together for a fun and tasty evening. Enjoy! 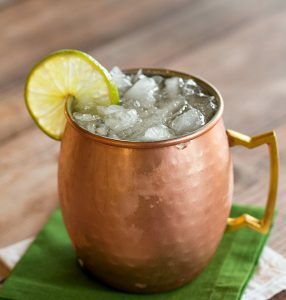 First, we need to start with a cocktail…NOLA Mule! I combine all the ingredients together in a carafe first, when you are entertaining it’s nice to have it ready to go. I like to use an ice-filled Mule cup but you can also use a Collins glass too. Garnish with quartered hard-cooked eggs (2 quarters for each bowl), chopped fresh thyme and fresh ground pepper. 1. In a large bowl, combine beans and cover by 4 inches: cover and let stand overnight. 2. Drain beans, and place in a large Dutch oven with ham hock, ½ teaspoon salt, and water to cover by 2 inches; bring to boil over medium-high heat. Reduce heat to medium-low; cover and cook until almost tender, about 1 ½ hours. Drain and removed ham hock. Using 2 forks shred ham. Mash beans and set aside. 1. Preheat the oven to 425. Combine the biscuit mix, milk, cheddar cheese, and 1 teaspoon of the herb mixture in a large mixing bowl, and mix to blend. With a tablespoon, scoop up the mixture and drop onto a greased baking sheet. Bake for 5 minutes. 2. Meanwhile, melt the butter in a small saucepan over medium heat. Stir in the parmesan cheese, 1 teaspoon of the herb mixture, the Tony’s seasoning, paprika and, the garlic powder. 3. Remove the biscuits form the oven and brush them with the butter mixture. Return the biscuits to the oven and continue to bake 5 minutes more, then brush again with the butter mixture. Return to the oven and continue to bake until golden brown. Brush the biscuits a final time with the butter mixture. Serve hot. Makes about 6 servings.